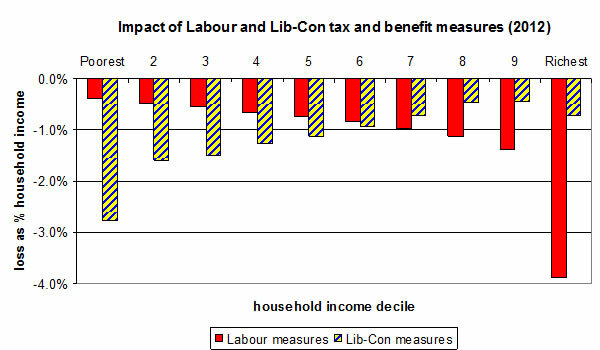 Labour’s fiscal stimulus helped make sure that recession didn’t turn into depression and that stimulus meant that people did not lose savings in their bank accounts, or mortgages didn’t collapse along with the banks, which would’ve led to people losing their homes. Yes, Labour did borrow to help us recover from the crisis and that is why we now face a large public debt. But there is an alternative to paying back that debt. The Labour alternative presented at the last election was to first focus on recovery and pay back 50% of the debt within the next Parliamentary term (4 to 5 years). The Lib Dem / Tory plan is to pay it all off within the same timeframe and starting the cuts now risks economic recovery as the first year following a recession is always fragile. Even Thatcher didn’t make any cuts following first year following the downturn in the 1980s. Figures from the independent Institute for Fiscal Studies show the difference between the current plans that are due to be implemented by the Coalition Government and the Labour alternative. At the last full council meeting, Lib Dem group leader Paul Lorber barked on about blaming Labour for the state of the economy, ignoring the role that banks had to play. But to say Labour is the reason why we’re in this mess is simply wrong… it’s irresponsible bankers that got us into this mess, and they should play a strong part in bearing the brunt of the costs for the role that they played getting us into this mess. While the Lib Dems and Tories are pushing out the message that Labour is to blame, the bankers responsible for the crisis are getting away with it. Posted on September 22, 2010 September 22, 2010 by Cllr Krupesh HiraniPosted in EconomyTagged 1980s, bank, bankers, Banking crisis, Brent Council. Full Council, Cllr Paul Lorber, Coalition Government, deficit, depression, economy, fiscal stimulus, IFS, Institute for Fiscal Studies, Labour, Left Foot Forward, Lib Dem / Tory coalition, Liberal Democrat, london borough of brent, Margaret Thatcher, Nick Clegg, Parties, Politics, Recession, Thatcher, Tory. You’re absolutely right. I would also like the council to spend more time pointing out that the cuts begin with central government diktat – most of the cuts we will be taking in Brent are wholly unnecessary, but the government chooses them.